2010 - A Top 10 List! This time of year I always love the "year in review" features you see in the newspaper and on TV. I always think "Wow, did all that happen this year?" and am amazed at how much life can be packed into 12 months. So I thought for today, I'd give you my Top 10 of personal favorites from Tea With Friends from the past year. Here we go! 1. In February, my husband continued a tradition of taking me to tea in honor of Valentine's Day, and this year we went to Rose Cottage in Pine Mountain. 2. 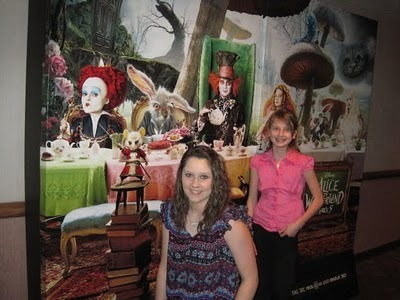 Tea lovers (including me) rejoiced at the release of the new "Alice in Wonderland" movie, which I was able to enjoy along with my nieces Madison and Cari in March. 3. My friends Beth, Sandra and a camera-shy Liz joined me for a "Celebrate Spring!" tea in April. We always have the best times together! 4. 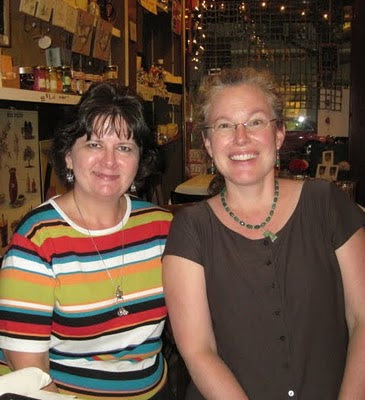 I had the pleasure of meeting "Frivolitea," a/k/a Lynn, in Atlanta in June. Meeting a new friend is absolutely tops on my list of fun things to do! 5. Getting to "meet" a new tea room is fun too. 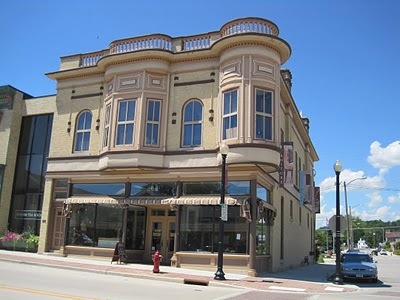 In July, Alex and I were visiting family in Wisconsin and got to enjoy tea at the terrific Atrium Tea Room in Sheboygan Falls. 6. Missourians Diane Graham, standing at right, and Julie Norris, seated, were passing through my neck of the woods in September and I had the great pleasure of meeting them for lunch at the Jasmine Tea Room. They are authors of the wonderful tea-themed devotional book "Woman of God - Moments of Grace," which my tea friend Phyllis in Michigan had thoughtfully introduced me to earlier in the year. 7. 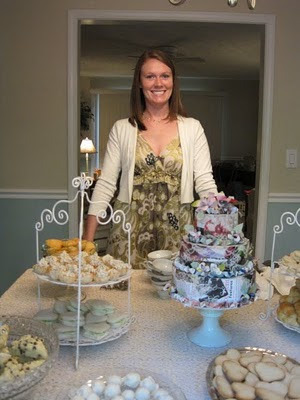 My friend Elizabeth's Bridal Tea was held at my home in early October, and it was so fun to be able to celebrate with her in this way. 8. 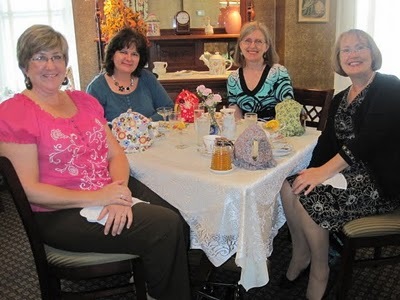 The first Teacup Exchange was held at Holly Cottage in October, and I attended along with tea friends and fellow bloggers Teresa, Maureen and Deberah. 9. Belinda from South Carolina (and Belinda's delightful friends!) 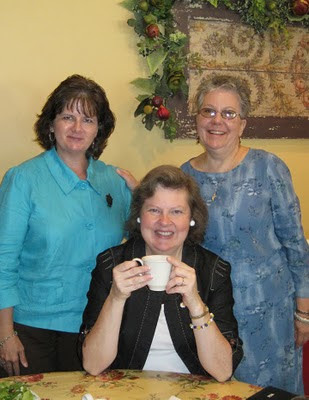 made a trip to Newnan in November and I got to join them for tea at Holly Cottage Tearoom here in Newnan. It was a tremendously fun and memorable day! This year, more than ever before, my life was made richer not just because of tea but because of my tea *friends*. When I looked back over posts from the past year, I would occasionally recall a favorite teacup or book I'd enjoyed, but I have to say the times with tea friends are what I remember most. Which just goes to prove, once more, that the greatest things in life aren't "things." 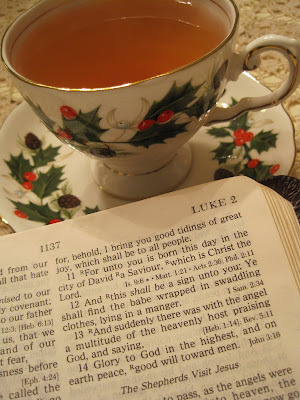 And so I wish a Happy New Year and a joyous 2011 to all my Tea With Friends friends -- truly, my cup runneth over! 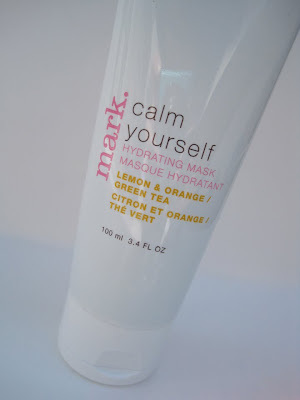 When I was ordering some Christmas gifts from Avon before the holidays, I also found a few goodies for myself, including this "Calm Yourself" facial mask from Mark, Avon's younger, hipper line of products. "This soothing gel-based mask adds moisture where you need it. Blended with calming green tea and aloe, moisturizing sea moss, plus, lemon and orange for radiance and clarity. A super hydrating complex keeps skin happy and healthy looking so you can remain calm." My skin needs a little moisture boost in winter, and I loved the way this mask made my face feel! A clearance item I found was this Green Tea & Mint Exfoliating Scrub for feet. It had a pleasant smell and worked beautifully for getting rid of dry, flaky skin. 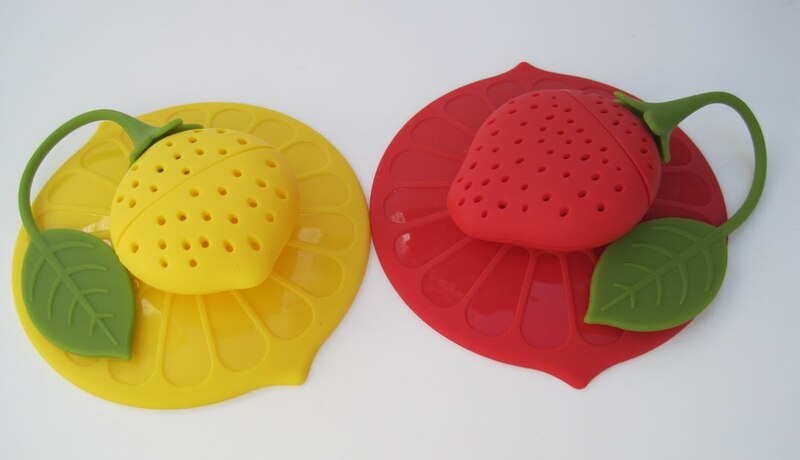 And these fruity tea infusers were also on clearance. I got them for the "cuteness" factor, but they also worked surprisingly well. Now I look forward to seeing what new tea goodies my Avon lady may have in store next year! As it got closer to Christmas and I got more and more things checked off my to-do list, I began spending more of the evening hours in my craft room working on my Sweet Tea Quilt begun this time last year. Since I'm about halfway finished hand-piecing the quilt top, I decided it was OK to start thinking about another project, so I began to look for inspiration. 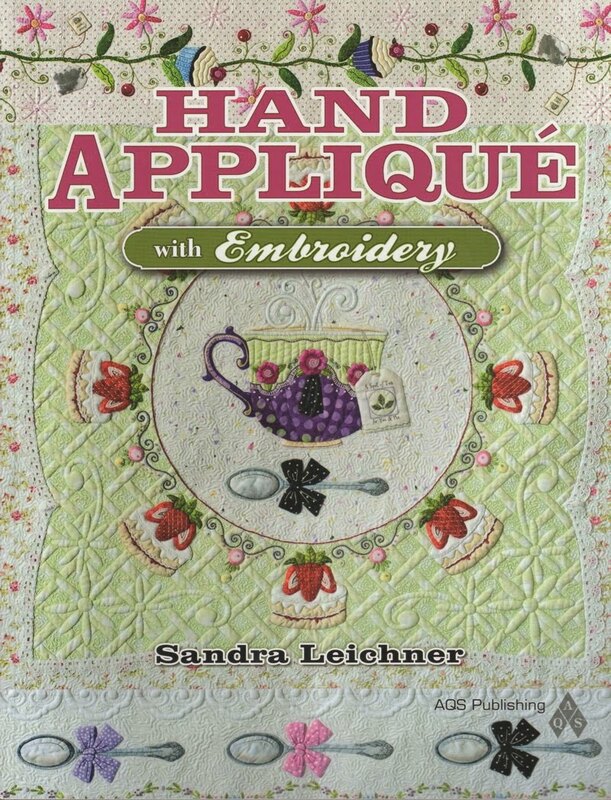 Recently I saw an advertisement for this new hand applique book, and the cover image alone sold me on it, as I'm sure you'll understand. Although I can make a straight stitch on the sewing machine when I have to, I enjoy handwork ever so much more, and so I'd like to upgrade my applique skills this winter. 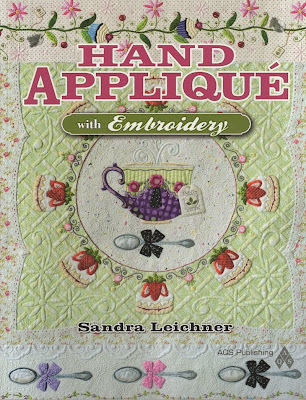 Not sure I'll reach this stitcher's skill level in this lifetime, but oh, what wonderful eye candy this book has for tea-loving stitchers! Here is a link to Sandra Leichner's blog post where she shows details from her magnificent tea-themed quilt. Be sure and check out the second photo with the teapot in the white border. Just incredible! Are any of you working on new craft projects this winter? I so enjoy hearing what everyone else is up to! Today, The McRae Company is announcing the retirement of Mrs. Tea. She joined the company in January of 2008 and has served admirably during that time. Mrs. Tea's career here, while brief, was marked by distinction and honor. 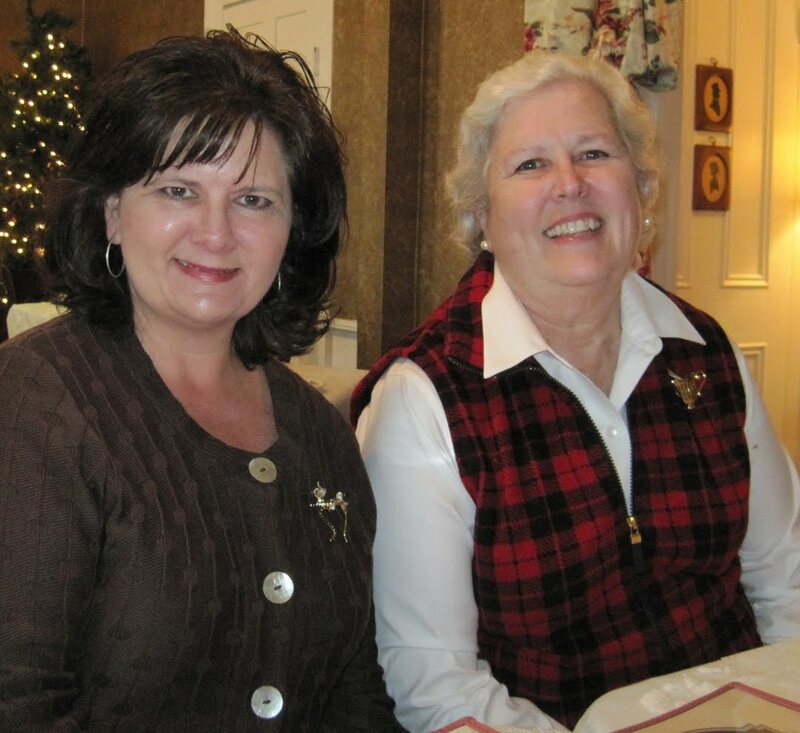 With a true servant's heart, she made a cup of tea for a single sipper with just as much gusto as she brewed up a pot for a tableful of distinguished guests at a birthday tea or spring luncheon. She was no respecter of persons and treated everyone with equal regard. In recent months, however, it became apparent that Mrs. Tea was suffering from serious health problems. The groaning and moaning she made during tea preparation were extremely uncharacteristic of her. And without becoming too indiscreet, it must be mentioned that bladder control became an issue and leakage was often left in her wake, a bit of an embarrassment to all concerned. The decision was made that it was time for Mrs. Tea's fine career to come to a close, and she, being her usual gracious self, agreed to step aside quietly and make room for a newcomer. So it is with much pleasure that the company today announces the hiring of Mr. Electric Water Kettle. Following an exhaustive search with the Amazon company, and after reviewing his many stellar references, Mr. Kettle was offered the position of chief tea maker for the company and assumed his new duties Dec. 25. ... other useful skills, such as bringing to the job an easy-to-read water level indicator. "We look forward to a long and mutually rewarding partnership with Mr. E.W. Kettle," said Angela McRae, spokesperson for the company. "While we certainly appreciate Mrs. Tea's service and wish her a happy retirement, we are delighted to be moving in a new direction and anticipate many productive days ahead." McRae also said she wished to acknowledge her husband's role in bringing Mr. Kettle into the company just in time for Christmas. A White Christmas ... in Georgia! You'd have to be a lifelong resident of the deep South to fuly appreciate this, I guess, but we had a White Christmas in Georgia this year -- unbelievable! This is what it looked like at my mom and dad's house shortly after we arrived on Christmas Day! Niece Amelia, 5, insisted on going outside in her cute new outfit, although I think she soon learned she was missing a significant piece of outerwear. Nephew Matthew, 2, kept going to the window and looking outside. I wonder if he'll possibly remember that it snowed on Christmas Day when he was 2. That has *never* happened in my lifetime, so a bunch of "old kids" like me here in Georgia were just beside ourselves! Alex and I left the celebration early so we could get back home without any trouble. I'll be the first to admit it: southern drivers do not know how to drive with a few snowflakes swirling about, so it's best to get on home, which we did, but the snow ended about halfway home. Happily, though, later that afternoon it started snowing here in Newnan, so we felt we got to enjoy two White Christmases that day, and this is what we woke to the day after Christmas! We did not, of course, return empty-handed, and I am happy to report that my mother did her usual fantastic job of compiling my gift from yard sale and antique store finds. One box was topped with this wonderful array of vintage linens, including tablecloths, doilies, placemats and more. ... these two Depression glass teacups in the Old Colony/Lace Edge pattern, which I love. I had never seen a Tea Shop cookie jar before, so I was very happy to get that, as it will be great for holding an assortment of tea bags, including some new ones with chai tea from my sister. ... a teacup garden accent from my friend Deberah, which will be put to good use in my tea garden this spring. I love how crafters are making these new garden accents out of old bottles and planters and teacups and such -- gives such "character" in the garden, I think. These are, as the song says, "a few of my favorite things," and tomorrow I'll tell you about the most useful tea gift I got for Christmas! So what about you? Did Santa bring you any fun tea goodies this year? And did you have a White Christmas too? Oops ... gotta go look out the windows, it's snowing again!!! Wishing all my tea friends peace and good will this Christmas Day! 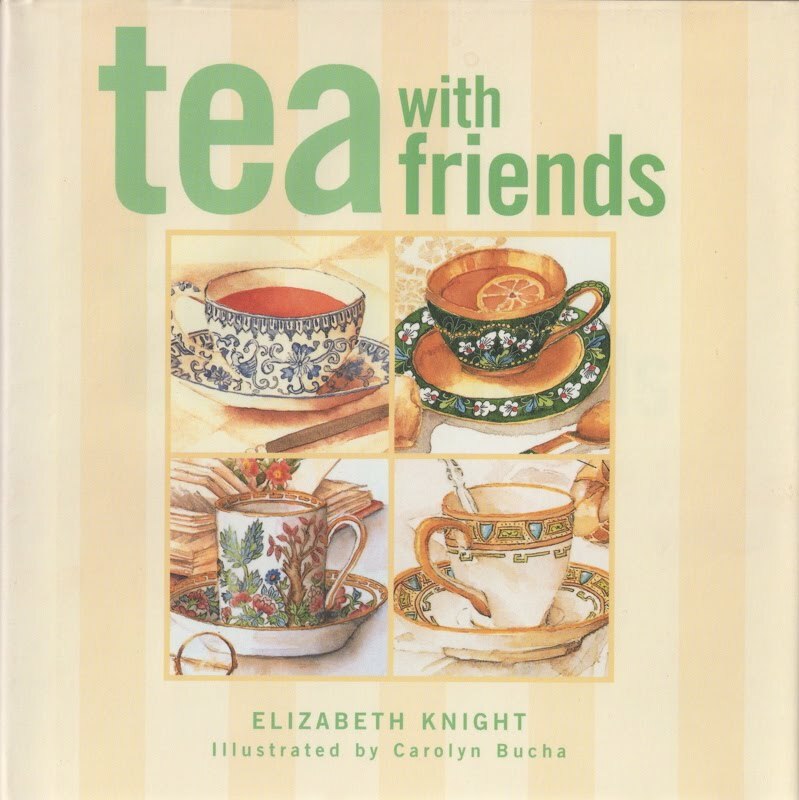 Tea and Books Saturday #52 - "Tea With Friends"
Since tomorrow is Christmas Day, I thought I would go ahead and post my final "Tea and Books Saturday" post of the year early, and I couldn't think of a better book to end on than "Tea With Friends" by Elizabeth Knight! This book was a gift from my friend Sandra a while back, and I love that my copy of "Tea With Friends" actually came from a dear tea friend! This book is small in size but big in information and inspiration. Knight, a well-respected tea expert here in the U.S., presents suggestions for teas for each month of the year. As we're closing out one year and looking forward to the next, I really enjoyed reading this book and thinking about what sorts of tea plans I wish for in the year ahead! Each month gets a chapter, and each includes a suggested menu, a featured recipe, ideas for the tea's decor and atmosphere, and even some historical tidbits related to the month at hand. I was thoroughly enlightened to read in the January chapter that Scottish Highlanders "considered a dark-haired man the luckiest first-footer to cross the theshold." My family has always observed lots of New Year's superstitions, one of which is that it's good luck if a man is the first one to cross your threshold in the new year. (Since I didn't marry until my forties, I considered it good luck if a man crossed my threshold EVER.) The book is also one of the few I've seen that has a handy chart listing a huge variety of teas and including the origin, description of flavor, brewing times and foods which complement each tea. I can't imagine a handier two pages for a tea lover to have! Well, I can't believe I have actually read 52 tea books this year! Someone once asked how many I have, and at the time I didn't know but now that I've cataloged them all I do: 148. But I can tell you that is nothing considering all the tea books "out there," and every time I look on eBay I find at least a few more I've never heard of. My wish list is always going to be very long. I would not be surprised if there are more than 500 volumes on tea available today. Next year, I'll no doubt review even more tea books, just not necessarily one a week. 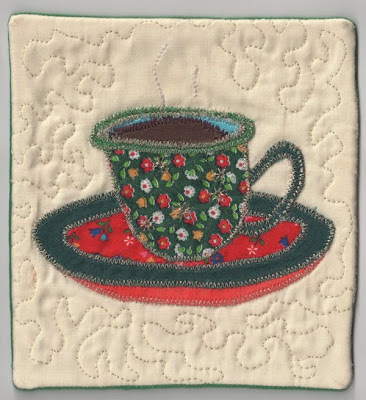 I will, however, be beginning a new Saturday series on quite a different teatime topic, so please join me Jan. 1 if you'd like to know what it is! Without really meaning to, I've had sort of a "homemade and handmade" theme going this week, so perhaps it's appropriate to end with a gift I made this year! 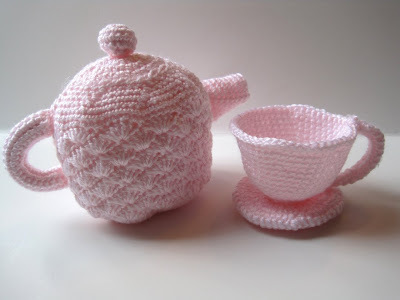 I'd been wanting to try this crocheted teapot and teacup I found in Crochet Today magazine (November 2008). When I became "tea pals" with Karin in Turkey a few months ago and she sent a photo of her sweet daughter Talya, I knew this was what I wanted to make for her! 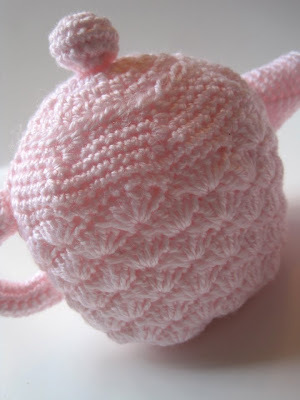 I was pleasantly surprised at how easy the pattern was, especially the shell stitch on the body of the teapot. 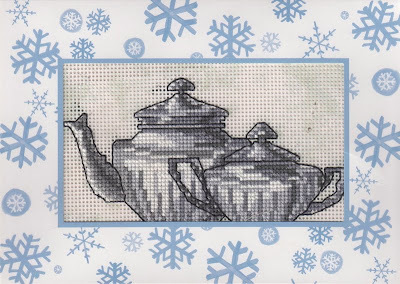 The directions for both teapot and teacup were very well-written, and I especially appreciated tips on how to attach the handles. The magazine's tea set was made of a metallic silver thread, but I wanted something soft and pink that looked more like a little girl, so I used pink baby yarn instead. 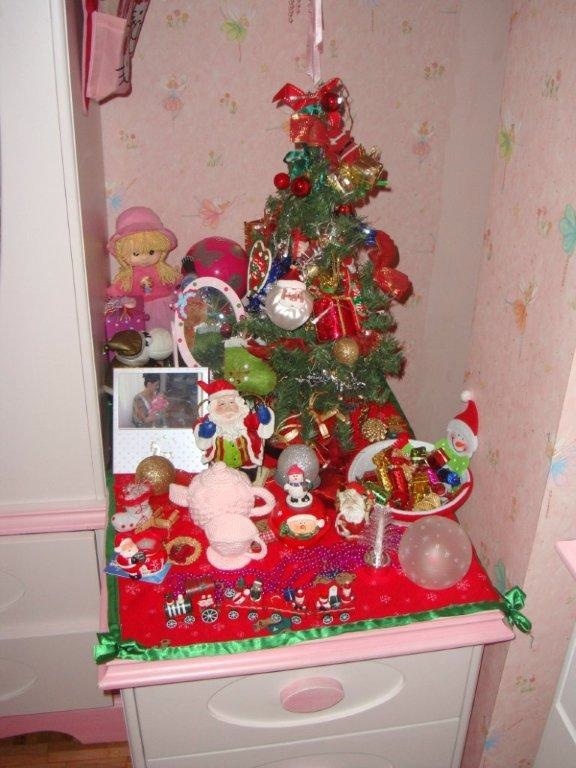 Happily, the package arrived in Turkey this week, and Karin thoughtfully e-mailed a photo showing the tea set as Talya displayed it by her own little Christmas tree in her room! Can you even *imagine* how happy this made me? It is so much more fun to give than to receive, isn't it! In my experience, the best person to give a handmade item to is someone who enjoys making handmade items herself (or himself, I should quickly add!). These are the folks who know how much work goes into something and can really appreciate it. While I've certainly enjoyed giving handmade gifts, I've been *overjoyed* to receive a few handmade gifts through this years, including this year's Christmas card from my friend ParTea Lady, which was cross-stitched by her husband Don. Isn't his work wonderful! ParTea Lady (a/k/a Maureen) and I met face-to-face for the first time last year, so I was really blown away when I, a new friend, got one of the cards last year. I will treasure both of these forever! ... a teacup coaster. I love the whimsical styling on these and, as with my cross-stitched cards, they are handmade gifts I thoroughly treasure! 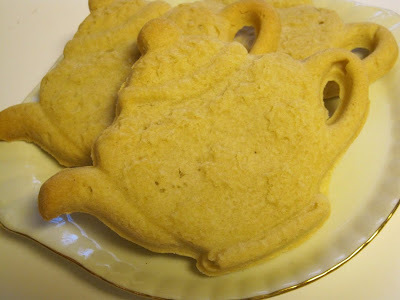 Sunday after church I decided I'd try making shortbread cookies with a teapot cookie mold I bought on eBay several years ago. It was the first time I'd ever used this mold, and it worked really well. Each cookie is rather large, about 6 x 5-1/2 inches. Here's a close-up of one of the cookies. 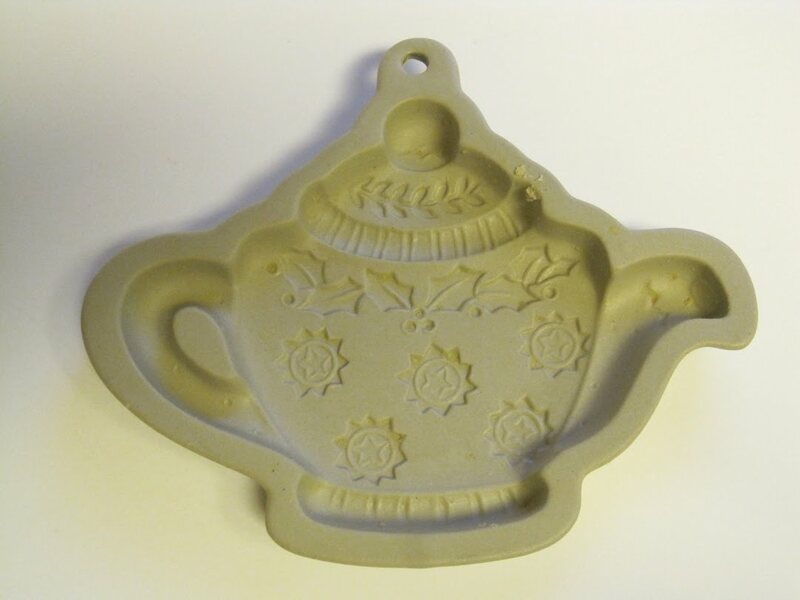 Can you see the holly leaves near the "lid" and the stars on the body of the teapot? If not, that's OK.
Because you can see them here, on the cookie mold! The only problem was, I have only one of these cookie molds and had to bake these cookies one at a time, which is definitely not the most efficient way to bake. (And I also felt guilty about wasting energy baking a single cookie at a time, but what can I say? Desperate times call for desperate measures.) This cookie mold isn't marked, but I've seen others like it on eBay described as Mary Engelbreit cookie molds, and the style certainly resembles hers. Brown Bag Cookie Art has a similar mold selling for about $20 on eBay right now, but I'm not willing to pay that. 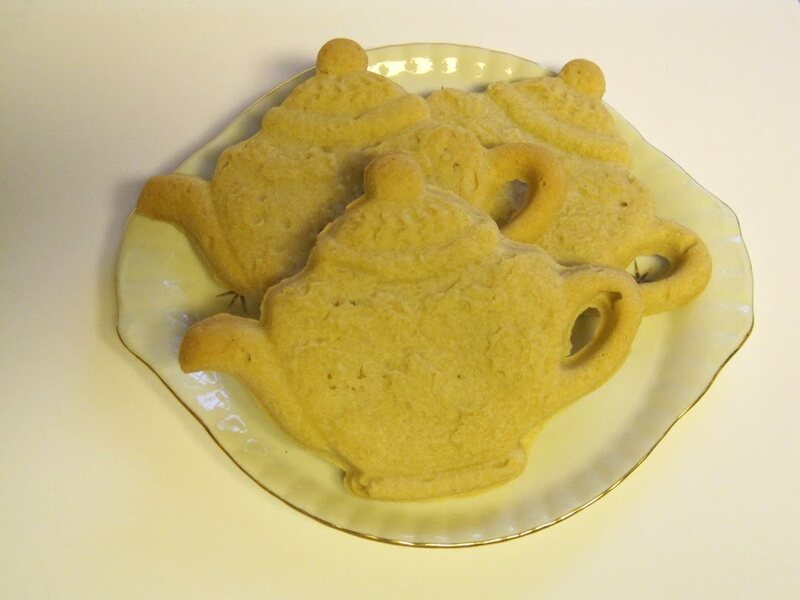 Hopefully, by next Christmas I will have acquired two more teapot cookie molds and can bake three of these at once, saving time, energy ... and sanity! Do you like raspberries? I love raspberries, but they're so pricey I usually don't splurge on them except at Christmas. It occurred to me this is the second year in a row I made a dessert for the office Christmas luncheon which featured raspberries and cream cheese. This dish is called Red Velvet Trifle, and it was so easy I felt like I was "assembling" more than baking. Basically, you make a Red Velvet Cake out of a box (purists may feel free to take the harder road), slice it up, then layer it with a concoction of cream cheese, lemon zest, low-fat vanilla yogurt and powdered sugar, then top with the berries. I had several requests for the recipe, and since it was such a hit I thought I would share it with you. Yummy and easy, feeds a crowd, looks pretty ... this meets all my requirements for a holiday dessert! I found the recipe in the Southern Living Christmas at Home magazine, but it's also available right here. 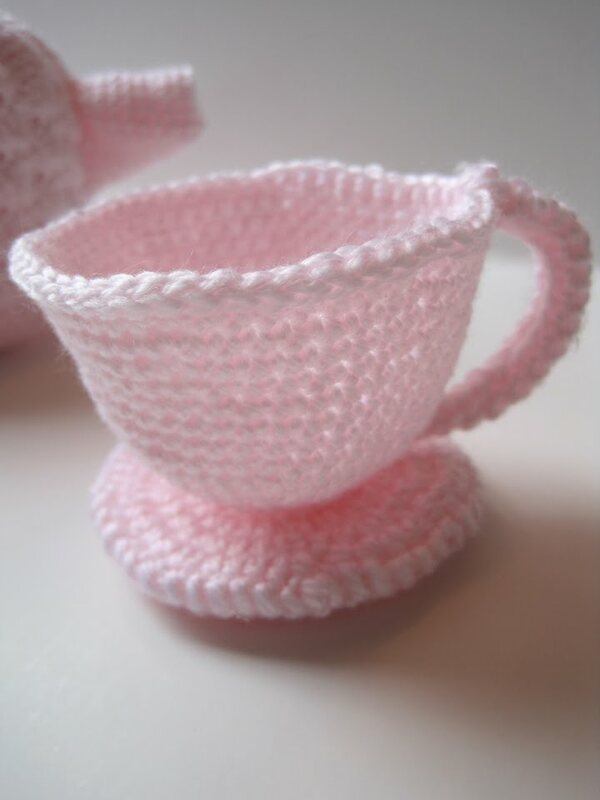 Truly the "sweetest" teacup ever! Last Thursday was such a great day at work, because A) we met our last magazine deadline for the year (yay!) and B) it was the day my friend Susan dropped off my Christmas present. Now whatever Susan gives me each year I know I am going to love, but this year she completely outdid herself with this stunning "sugar art" teacup and saucer she made. Susan, who is well-known locally for her baking and cake artistry, tells me the entire thing is edible, but if I don't decide to eat it (and heaven forbid, who would! ), it should last forever. ... and even inside the cup to make it more dimensional! The cup and saucer set was also decorated with edible luster dust, which is what gives it that pretty, frosty sparkle. I think this is just the most amazing gift, and I absolutely could not wait to show it to you! 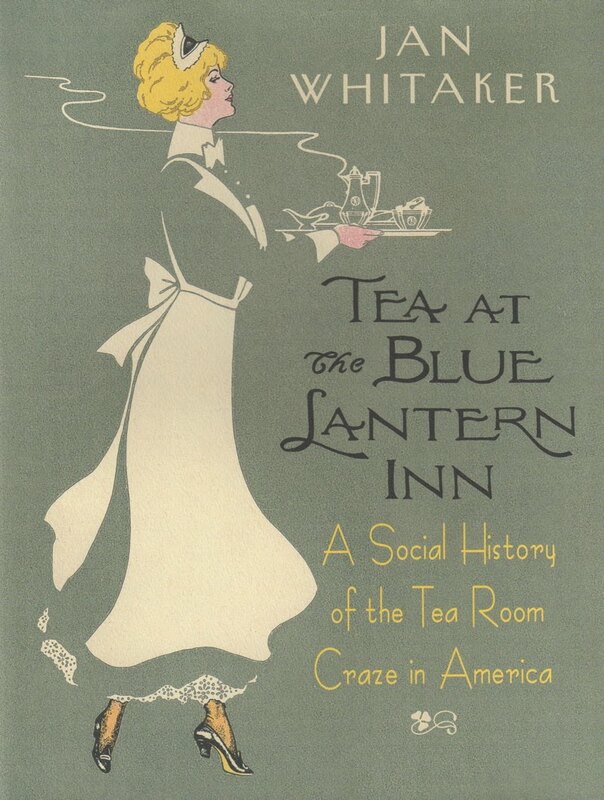 Tea and Books Saturday #51 - "Tea at the Blue Lantern Inn"
Within a 45-minute drive of my home, there are four different eating establishments that have billed themselves as tea rooms. At Mary Mac's Tea Room in Atlanta, open since 1945, diners can get everything from a vegetable plate to meatloaf, fried chicken and classic southern desserts. At the Zodiac Cafe in Neiman Marcus in Atlanta, the store's tea room tradition continues and you can find tasty light luncheon fare such as a salmon salad or fresh popovers. Closer to home, Sharpsburg's Jasmine Tea Room, located in an antique mall, has delicious muffins, quiches and sandwiches, all served in homelike, attractive surroundings. 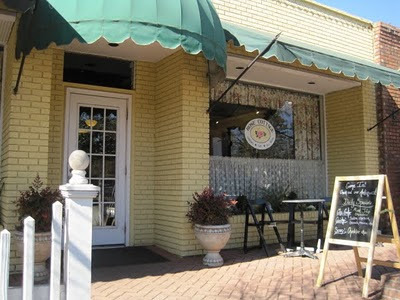 And of course there's my wonderful English style tearoom, Holly Cottage in Newnan, where I will be dining today, in fact! Reading about the early tea room food was one of the things I most enjoyed about the book, though I am still debating whether I am brave enough to actually try Creamed Chicken on Waffles, Tomato Aspic or "Egg Surprise." This was a book I hated to see end, but I turned the final page and was consoled by one happy thought: Whitaker has also written a history of American department stores called Service and Style, and it's at the top of my reading list! It's definitely the season for staying indoors and doing needlework, so I've been gathering a few new quilting magazines to get me through the winter. 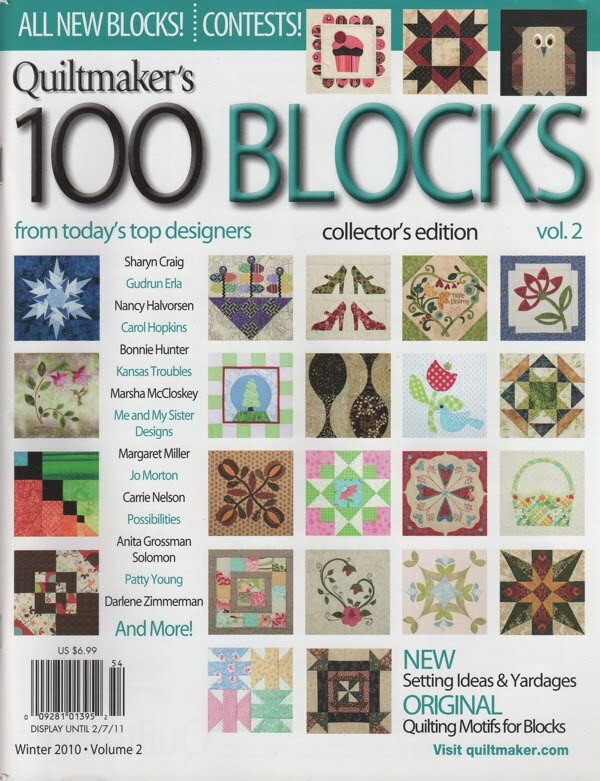 Quiltmaker's magazine came out with a 100-blocks issue last year that I was sorry I didn't get, so this year I was sure to pick up a copy when I saw this one at the grocery store. Inside, I was pleased to find we tea fans are included this year! 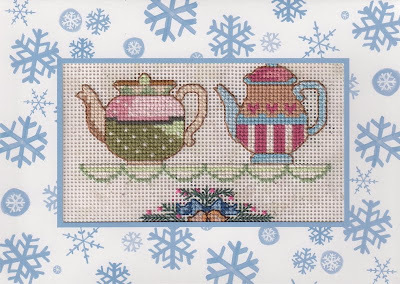 Isn't this Holiday Tea block pretty? 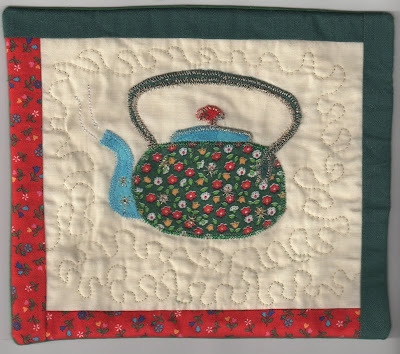 Of course, with a little change of colors this block could be used for a tea-themed quilt any time of the year. And I thought of several shoe-loving friends (and relatives) when I saw this block. This would make a terrific quilt for a shoe lover, wouldn't it! So if you're into quilting as well as tea (or shoes), you may want to look for this issue before it's sold out! Wrapping up a very Mary Christmas!